At West Coast Solar, we’re excited to see residential solar systems taking on a new role for homes. Not only do they produce clean energy, but they’re actually raising home values in Sacramento. How could a home solar power system increase the value of a building? Well, consider how you get your energy now. It runs through a grid, and you pay for your usage—typically, per kilowatt. What if you didn’t have to use energy from a utility company, and you could produce your own? And what if that renewable energy source was free to use? This is the beauty of renewable, alternative energy sources—primarily the sun. 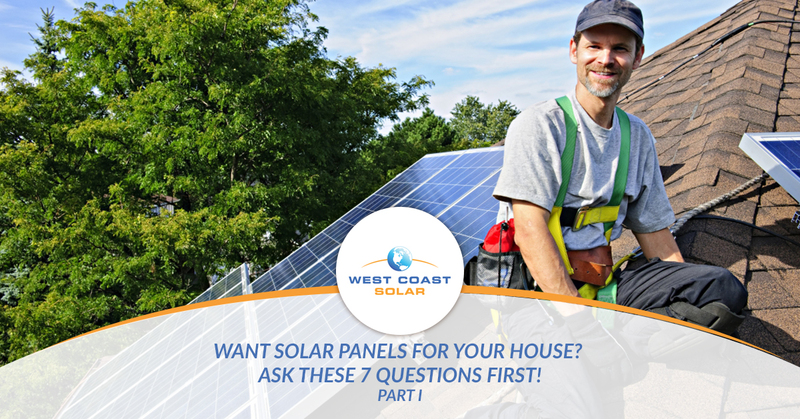 For those who are already researching solar panels for their home, there are a few questions you want to ask before committing to a solar energy system. Would you rather talk to a professional about your questions? Great! Give West Coast Solar a call today! Otherwise, continue reading this blog series to learn more. Question #1 – How energy efficient is your home? It’s important to understand the energy efficiency of your home to determine if you can reduce energy usage by simply patching up a few common house energy issues like drafts, insulation problems, structural discrepancies and more. Complete a home energy audit – Hire a professional to inspect your home for energy inefficiencies. Monitor and replace appliances – Most homes use their appliances like a fridge, stove, or washing machine for more than a decade before considering replacing it. In most cases, appliances don’t get replaced until they break beyond repair. Your appliances could save you money, if you repair them or make the switch to smart technology. Examine lighting – Make the switch to energy efficient bulbs. Install smart technology in your home. There are a number of ways to decrease energy use through your lights. HVAC inspection – Call an HVAC expert to come out and inspect your entire system. You may find that air is escaping into your attic or basement where it shouldn’t be going. Alternatively, maybe your AC/Heating system isn’t functioning properly, which could cost you more money for less air flow, whether cold or warm. Pair these energy efficiency tactics to the use of a solar power system, and you could see your utility bill decrease substantially—some of our customers actually get credit from their utility company for selling energy back to the grid they produced with the solar system. When it comes to solar power, we are your experts that service Sacramento. We’ve helped residents and business owners in the area make the switch to solar, and we’re ready to help you. Whether you want to save money on your utility bills, help the environment, or both, give us a call today! Continue reading to learn more about question two in this blogs series: What is your solar potential? It’s important to learn as much as you can before purchasing and installing your system to get the most out of it.